this tool intended for aproximation surfaces, curves and pcurves with specified degree , max number of segments, tolerance 2d, tolerance 3d. Specified continuity can be reduced if approximation with specified continuity was not done. Initializes with specified parameters of aproximation. Returns the continuity of <NewE> between <NewF1> and <NewF2>. <NewE> is the new edge created from <E>. <NewF1> (resp. <NewF2>) is the new face created from <F1> (resp. <F2>). Returns Standard_True if the curve has been modified. if flag IsOf equals Standard_True Offset curves are aproximated to Offset if Standard_False to BSpline. Returns Standard_True if the pcurve has been modified. if flag IsOf equals Standard_True Offset pcurves are aproximated to Offset if Standard_False to BSpline. Returns Standard_True if the surface has been modified. if flag IsOf equals Standard_True Offset surfaces are aproximated to Offset if Standard_False to BSpline. Returns error for aproximation curve2d. Returns error for aproximation curve3d. Returns the container of modes which defines what geometry should be converted to BSplines. Returns error for aproximation surface, curve3d and curve2d. Returns (modifiable) the flag which defines whether the curve2d is aproximated. Returns (modifiable) the flag which defines whether the curve3d is aproximated. Returns (modifiable) the flag which defines whether the surface is aproximated. Returns number for aproximation surface, curve3d and curve2d. Returns Standard_True if curve from the edge <E> has been modified. In this case, is the new geometric support of the edge, <L> the new location, <Tol> the new tolerance. Otherwise, returns Standard_True if Surface is modified or one of pcurves of edge is modified. In this case C is copy of geometric support of the edge. In other cases returns Standard_False, and , <L>, <Tol> are not significant. Returns Standard_True if the edge <E> has been modified. In this case,if curve on the surface is modified, is the new geometric support of the edge, <L> the new location, <Tol> the new tolerance. If curve on the surface is not modified C is copy curve on surface from the edge <E>. Otherwise, returns Standard_False, and , <L>, <Tol> are not significant. <NewE> is the new edge created from <E>. <NewF> is the new face created from <F>. They may be usefull. Tol is the new tolerance. If there is no new parameter this function returns false, and the values of P and Tol are not significant. Tol is the new tolerance. If the vertex has not been modified this function returns false, and the values of P and Tol are not significant. Returns Standard_True if the face <F> has been modified. In this case, <S> is the new geometric support of the face, <L> the new location,<Tol> the new tolerance.<RevWires> has to be set to Standard_True when the modification reverses the normal of the surface. (the wires have to be reversed). <RevFace> has to be set to Standard_True if the orientation of the modified face changes in the shells which contain it. Otherwise, returns Standard_False, and <S>, <L>, <Tol> , <RevWires> ,<RevFace> are not significant. Sets continuity3d for aproximation curve2d. Sets continuity3d for aproximation curve3d and surface. Sets flag for define if rational BSpline or Bezier is converted to polynomial. If Rational is True approximation for rational BSpline and Bezier is made to polynomial even if degree is less then MaxDegree and number of spans is less then specified MaxNbSegment. Sets max degree for aproximation. Sets max number of segments for aproximation. Sets priority for aproximation curves and surface. If Degree is True approximation is made with degree less then specified MaxDegree at the expense of number of spanes. If Degree is False approximation is made with number of spans less then specified MaxNbSegment at the expense of specified MaxDegree. 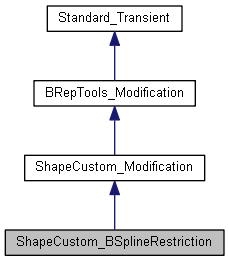 Sets the container of modes which defines what geometry should be converted to BSplines. Sets tolerance of aproximation for curve2d. Sets tolerance of aproximation for curve3d and surface. Returns error for aproximation surface.